Bluebird Nordic Boeing 737-300F for the FAIB Boeing 737-300 FSX Logolight base models. Bluebird Nordic Boeing 737-300F for the FAIB Boeing 737-300 FS9 Logolight base models. Bluebird Nordic Boeing 737-400F for the FAIB Boeing 737-400 FSX Logolight base models. These are FSX textures only. The FAIB Boeing 737-400 Logolight FSX base model is required. Bluebird Nordic Boeing 737-400F for the FAIB Boeing 737-400 FS9 Logolight base models. These are FS9 textures only. The FAIB Boeing 737-400 Logolight FS9 base model is required. Bluebird Cargo Boeing 737-300F fleet 2016 for the FAIB Boeing 737-300 Logolight FS9 base model. These are FS9 textures only. The FAIB Boeing 737-300 Logolights FS9 base model is required. Bluebird Cargo Boeing 737-300F fleet 2016 for the FAIB Boeing 737-300 Logolight FSX base model. These are FSX textures only. The FAIB Boeing 737-300 Logolights FSX base model is required. 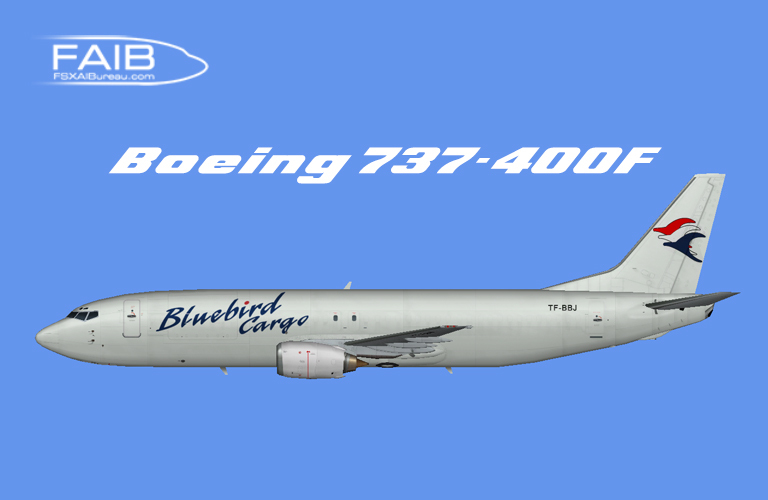 Bluebird Cargo Boeing 737-400F for the FAIB Boeing 737-400 Logolight FSX base model. Bluebird Cargo Boeing 737-400F for the FAIB Boeing 737-400 Logolight FS9 base model. The first release from Dennis! 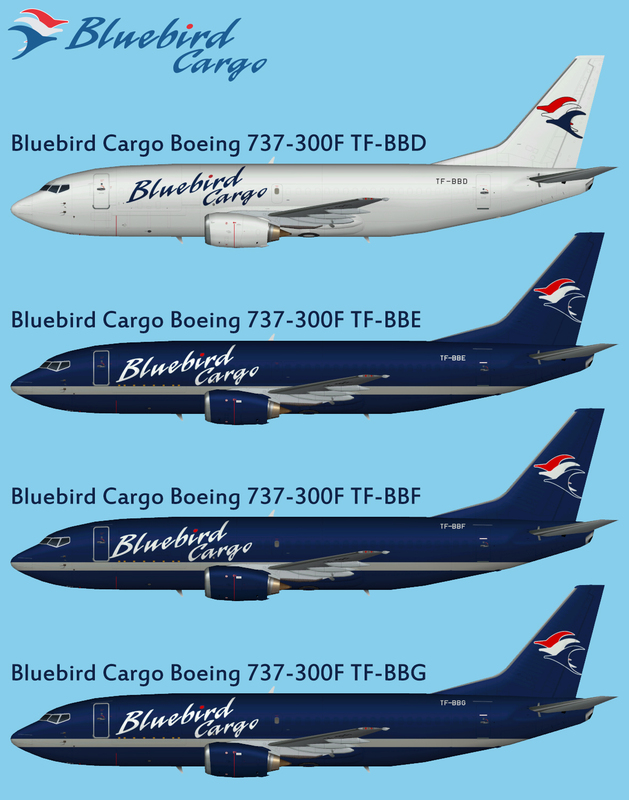 Bluebird Cargo Boeing 737-300F fleet repaints for the FAIB Boeing 737-300 logolight FS9 base model. These are FS9 textures only. The FAIB Boeing 737-300 logolight base model is required. 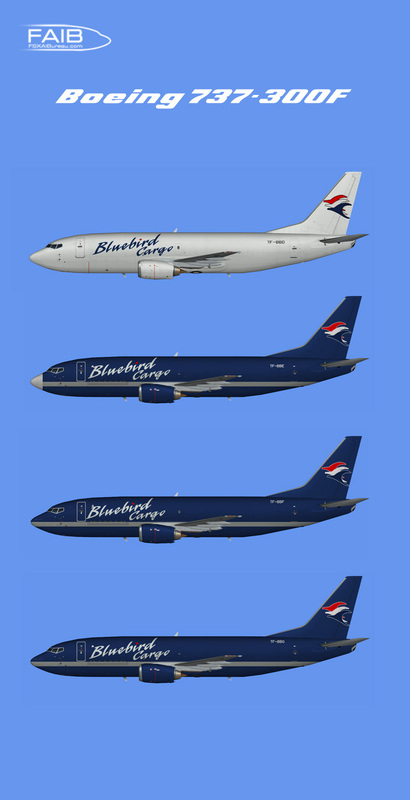 Bluebird Cargo Boeing 737-300F fleet repaints for the FAIB Boeing 737-300 logolight FSX base model. These are FSX textures only. The FAIB Boeing 737-300 logolight base model is required.